Citicorp, for example, issued a forecast proclaiming that “the bull argument is based on a faulty analysis,” and that oil prices “will fall back into a band between US$45 and US$65 in just over a year.”This raises the question of whether investing in the energy sector represents an attractive risk-reward opportunity. Energy sector prices are based both on oil prices as well as the growth in companies’ production volumes. And XLE prices have an 84% negative correlation to oil prices (November 26, 2014, to July 27, 2018). 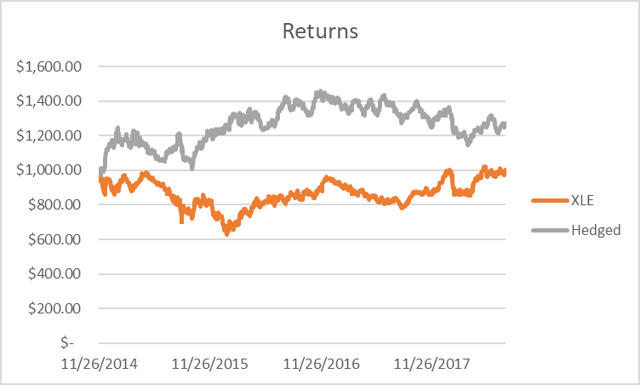 I tested the concept of including an oil price hedge to an energy sector portfolio (XLE) and found that it provided a better risk-adjusted return than an Unhedged XLE portfolio. Specifically, the Hedged XLE portfolio yielded a 25% return with a 20% maximum drawdown from peak (i.e., loss). This compares favorably to the Unhedged XLE return of 0% and maximum drawdown from a peak of 37%. 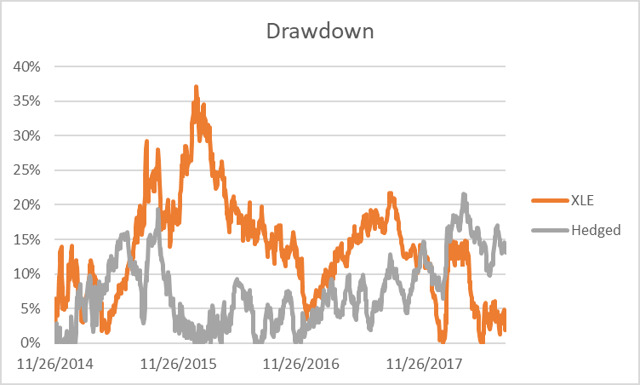 I use drawdown-from-peak as my main risk measurement since it shows the loss that was sustained from a “high water mark.” I believe this loss is the primary risk that should be minimized. For the test period, a hedge ratio of 30% provided the lowest drawdown from the peak. In other words, for a $100,000 portfolio of XLE contracts, there would be a $30,000 portfolio of SCO contracts. Investors should attempt to construct the highest risk-adjusted portfolios to maximize returns. And portfolios should be constructed to keep losses within maximum tolerances. If losses exceed tolerances, investors may liquidate positions when the tolerance limit is met, locking in losses that may difficult or impossible to recover. It is often said that the best portfolio is one in which the investor can sustain even during the worst period of losses. And so with oil price risk being a major factor in the returns of energy sector portfolios, it is prudent to reduce oil price risks through hedging. The test period has run through a complete down and up oil price cycle. And the hedge enabled the portfolio to achieve a lower risk and a higher return overall. Oil price risks have become highly elevated as a result of the U.S. pulling out of the Iran nuclear deal. Sanctions may result in lower Iranian crude exports beginning in November. On the other hand, the president has several options to reduce oil price spikes. President Trump has asked Saudi Arabia to pump more oil. The treasury secretary can grant waivers to some countries, allowing them to buy Iranian oil. And oil from the Strategic Petroleum Reserve may be released to offset losses to production. With the various risks that can move prices up or down, a hedge for the energy sector is likely to provide valuable benefits.